Highlighting behind the scenes of the Tour de France, this title reveals the exotic, contradictory, hysterical and brutal world of professional cycling from the viewpoint of someone right in the thick of it. It follows Britain's best cyclist Mark Cavendish through the mayhem of the Tour de France. "Boy Racer" steps behind the scenes of the Tour de France. It unmasks the exotic, contradictory, hysterical and brutal world of professional cycling from the compellingly candid viewpoint of someone right in the thick of it. Written off as 'fat' and 'useless' in his youth, Mark Cavendish is now cycling's brightest star. His extraordinary quadruple stage-win at last year's Tour proved him Britain's best ever cyclist. Some have called him cocky, but to anyone who doesn't like his style, Mark will simply shrug his shoulders and reply, 'I know I'm good. There's no point lying about it.' Peers say that they have never seen anyone with Cavendish's hunger for success and while this fearlessness - both in the saddle and on the record - has at times led to controversy, it has also earned him the respect of ever more fans. 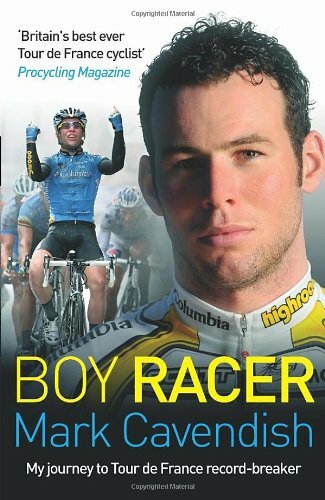 In "Boy Racer", we follow him through the mayhem of the Tour de France in a page-turning journey of pure exhilaration.